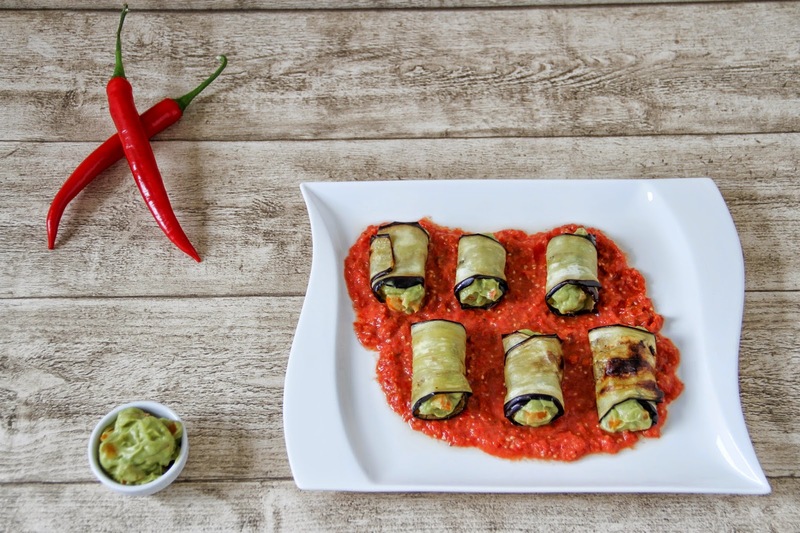 These little eggplant rolls have become my new favourite summer dish. They are incredibly light, refreshing and full of taste. 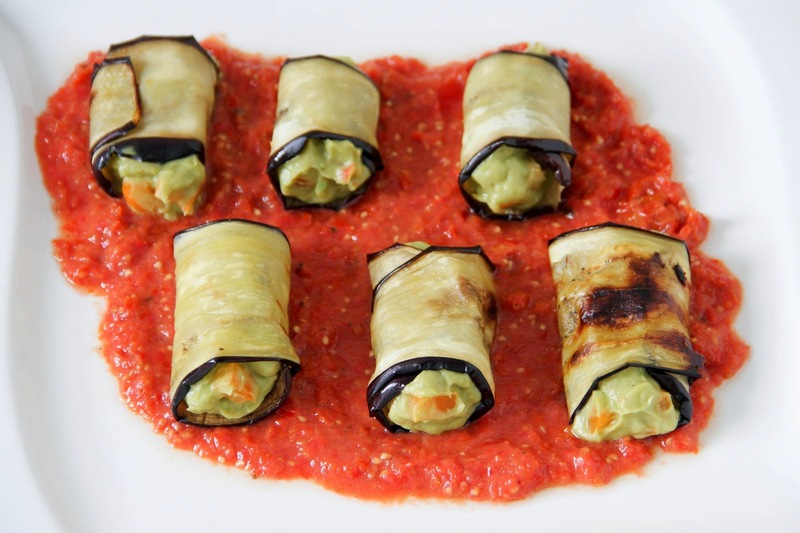 Eggplant rolls, with or without the juicy tomato salsa, will definitely make your summer dinners an incredible feast. Whether you roast the eggplant slices in the oven or on the grill, serve them as appetizers or sides, I guarantee you, your guests will be delighted. 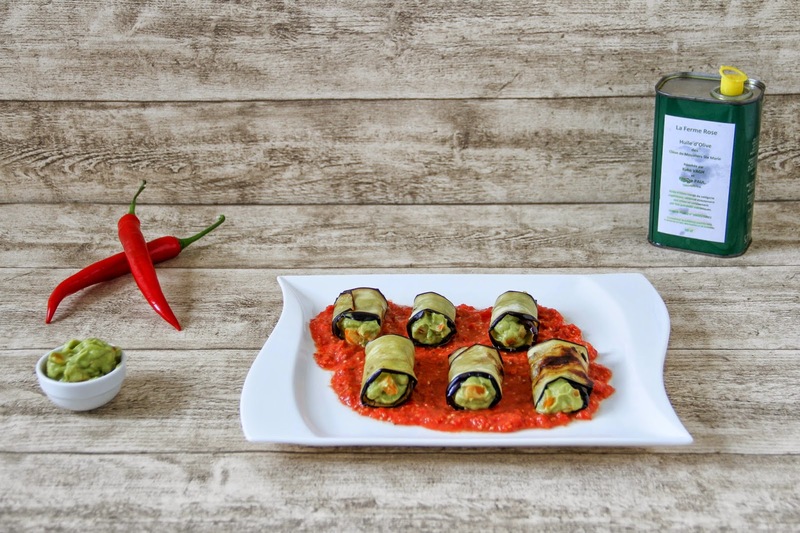 Moreover, if you have vegetarians at home, or chose to have meatless days, these eggplant rolls will enable you to change from the ordinary ratatouille or vegetarian pasta. I love it because the flavors remind me of the Mediterranean. Fresh olive oil, dried tomatoes, roasted eggplants; make only a few yet tasty ingredients of the South. Over summer I have decided to put again more effort into cooking vegetarian dishes. To pay more attention to diverse flavours to vary just a little bit more. When I was living in the South of France I went with the seasons, as I generally did all the food shopping on the market next door. Back up north, things have changed again, which I regret a little. When I started cooking, I was not so much of a meat fan. Accordingly, I spent more experimenting in order to avoid eating the same thing over and over again. Over the years, I have become a meat lover. I'm not the typical carnivore, but still, I do love meat now. And it seems that I pay more attention to the preparation of the meat, than to the choice of the sides. Willing to change this little yet important detail, I investigated on interesting recipes and just adapted or developed my own little combos. Cut the eggplant lengthwise into thin slices. Rub in olive oil on both sides and season with salt. Cover your baking tray with baking sheets and place the eggplant slices on it. Bake for 10 minutes until the eggplant slices are golden brown. Remove them from heat and set aside to cool slightly. Cut the avocados in half and scoop out the flesh into a blender with a spoon. Core the chili peppers and orange peppers, then dice. Squeeze the lemon until you obtain 1 tbsp of lemon juice. Add the lemon juice and the diced red peppers to the avocados. Add the zest of half a lemon and start mixing until you get an even mixture. Season with salt and paper. 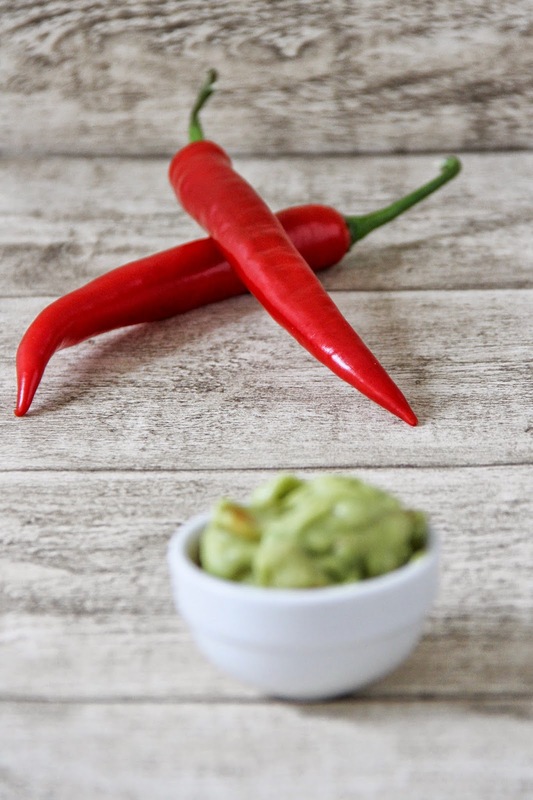 Pour the avocado chili mix into a bowl and add the peppers. Mix with a spoon. Blend the fresh and dried tomatoes as well as the garlic clove. Season with salt and pepper. To prepare your rolls, place them with the widest side of the eggplant slices facing you. 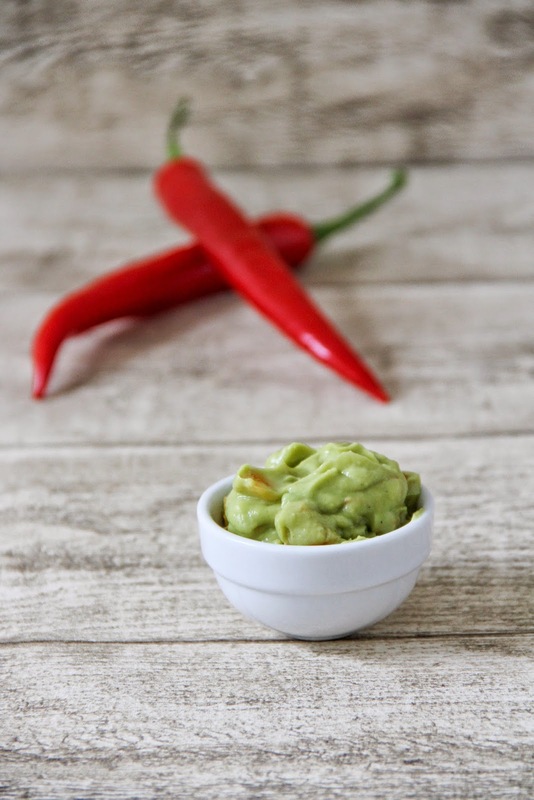 Distribute evenly the avocado chili mixture onto each slice. Roll each piece starting from the widest end and please it on a plate, preferably seamed side down. 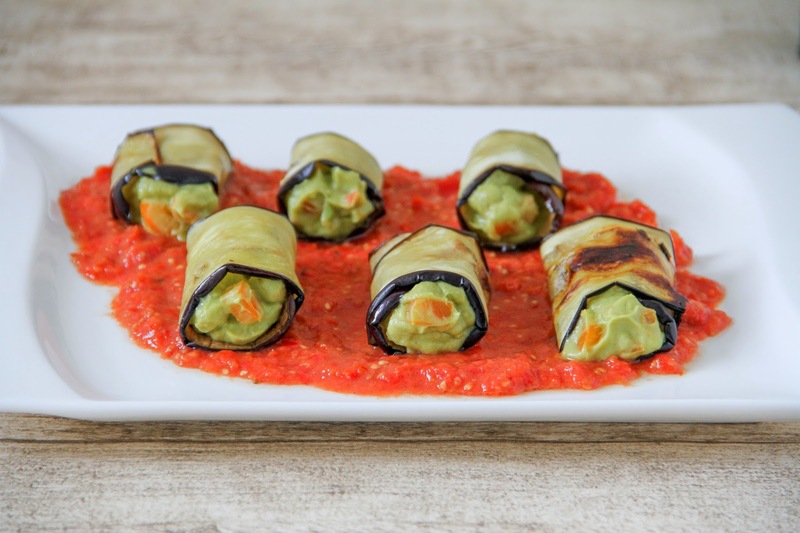 To arrange the place, pour the tomato salsa on the plate and add the eggplant rolls.